Illustrations: 24 black-and-white photos and 4 maps. In the Puget Sound region of Washington state, indigenous peoples and their descendants have a long history of interaction with settlers and their descendants. Indians in the Making offers the first comprehensive account of these interactions, from contact with traders of the 1820s to the Indian fishing rights activism of the 1970s. 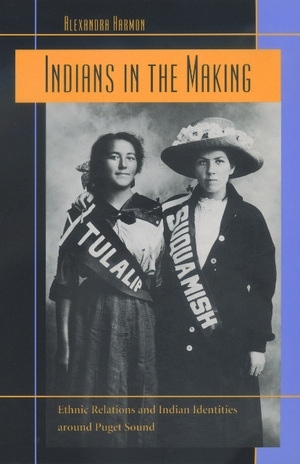 In this thoroughly researched history, Alexandra Harmon also provides a theoretically sophisticated analysis that charts shifting notions of Indian identity, both in native and in nonnative communities. During the period under consideration, each major shift in demographic, economic, and political conditions precipitated new deliberations about how to distinguish Indians from non-Indians and from each other. By chronicling such dialogues over 150 years, this groundbreaking study reveals that Indian identity has a complex history. Examining relations in various spheres of life—labor, public ceremony, marriage and kinship, politics and law—Harmon shows how Indians have continually redefined themselves. Her focus on the negotiations that have given rise to modern Indian identity makes a significant contribution to the discourse of contemporary multiculturalism and ethnic studies. Alexandra Harmon is Assistant Professor in the American Indian Studies Center at the University of Washington.